Distressed by his father's death and his mother's over-hasty remarriage, Hamlet, Prince of Denmark, is faced by a specter from beyond the grave bearing a grim message of murder and revenge. The young prince is driven to the edge of madness by his struggle to understand the situation he finds himself in and to do his duty. Many others, including Hamlet's beloved, the innocent Ophelia, are swept up in his tragedy. 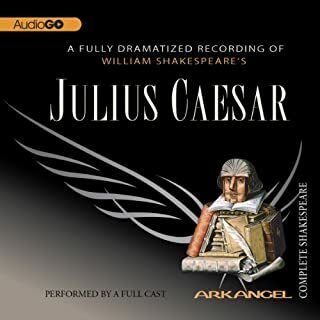 At the heart of this tragic history is one of Shakespeare's most noble characters, the statesman Brutus, who is caught in a devastating conflict between private affection and public duty. Julius Caesar has become the most powerful man in the Rome. Does his power now threaten the very existence of the Republic itself? A conspiracy is hatched, one that will have fatal consequences not only for Caesar and the conspirators but for the future history of the ancient world. Rosalind, daughter of the deposed Duke Senior, is exiled from the court by her wicked uncle. Disguising herself as a young man and accompanied by her cousin Celia, she takes refuge in the Forest of Arden. In the forest Rosalind meets Orlando with whom she is in love, but her male disguise complicates matters, especially when Rosalind finds she has unwittingly attracted the shepherdess Phebe. But out of the confusion comes reconciliation and forgiveness, and all ends happily. Othello, a Moorish general in the service of Venice, has married Desdemona, beautiful daughter of a Venetian senator. But Iago, Othello's malignant ensign, is determined to destroy their happiness. Cunningly bending Othello to his own purposes, Iago persuades the Moor that Desdemona is unfaithful to him. Tormented in a hell of jealousy, Othello moves inexorably toward the destruction of his innocent wife and himself. Chaos and confusion mount to a crescendo in a wild and fast-paced comedy of mistaken identity, one of Shakespeare's earliest plays. Young Antipholus of Syracuse is searching the world for his identical twin brother, separated from him at birth. With him is his servant Dromio, who lost his twin brother at the same time. The pair arrive in Ephesus where, unbeknownst to them, their twins are living. Kenneth Branagh and Alex Kingston star in Shakespeare's tragedy of love and power. As part of BBC Radio 3's celebration of the 450th anniversary of the birth of William Shakespeare, Kenneth Branagh and Alex Kingston star in this brand-new production. 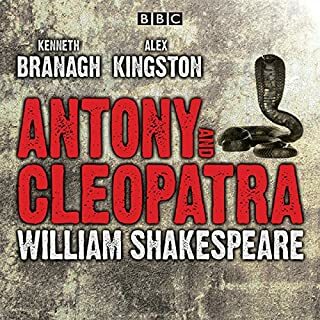 Lovers, politicians, superstars... Antony & Cleopatra is Shakespeare’s late and epic tragedy of mature love, and the catastrophic fall from grace and power that it brings about. Shakespeare's most sophisticated comedy is a riotous tale of hopelessly unrequited passions and mistaken identity. Duke Orsino is in love with the noblewoman Olivia. She, however, has fallen for his servant Cesario, who is actually Viola, a woman disguised as a man, who loves Orsino: Confusion is rife. Meanwhile, Olivia's arrogant steward Malvolio is cruelly tricked by her uncle Sir Toby Belch, his friend Sir Andrew Aguecheek, and the maidservant Maria into believing his mistress loves him. When Oberon, King of the Fairies, uses his magic upon four runaway lovers in a midsummer wood outside Athens, chaos ensues. Who really loves whom? Meanwhile, a band of well-meaning but bungling local actors have their rehearsal sabotaged by the mischievous Puck, who bewitches their leader, Bottom, and Titania, the Fairy Queen. The result is a lively and anarchic comedy which can only be resolved by an elaborate disentangling of spells. 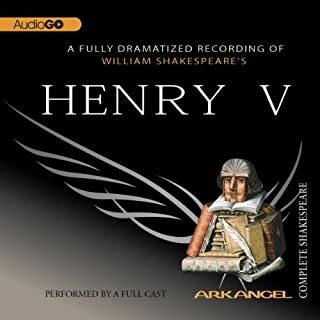 Henry V is a study of kingship, patriotism, and heroic determination tempered by tender comedy as Henry courts Katherine, princess of France. Henry, the noble and courageous young king of England, decides to invade France, believing he has a rightful claim to the throne. At Agincourt he leads his army into battle against the powerful French forces and, against all the odds, wins a famous victory. This haunting drama of vengeance and forgiveness crowns the group of tragicomic romances that Shakespeare composed at the end of his career. Sometimes read as his farewell to the stage, the play contains some of Shakespeare's most lyrical verse. Prospero, wise Duke of Milan, has been deposed by Antonio, his wicked brother, and exiled with his daughter Miranda to a mysterious island. But Prospero possesses supernatural powers. Aided by the spirit Ariel, Prospero uses his magical art to bring his enemies under his control. Prospero is played by Bob Peck, Ariel by Adrian Lester, Jennifer Ehle is Miranda, Simon Russell Beale is Antonio, Jamie Glover is Ferdinand, and Richard McCabe plays Caliban. What made the experience of listening to The Tempest the most enjoyable? The actors and the production always make ArkAngel top notch! What other book might you compare The Tempest to and why? Any ArkAngel production of Shakespeare... 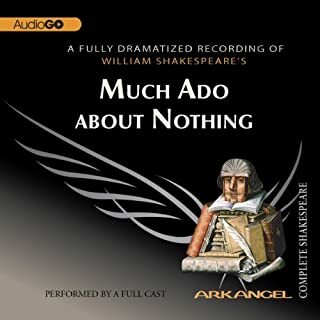 I particularly enjoy Macbeth, Hamlet, Othello, A Midsummer Night's Dream, Antony and Cleopatra, Taming of the Shrew, King Lear and Romeo and Juliet. The casting of actors is completely appropriate for the characters. 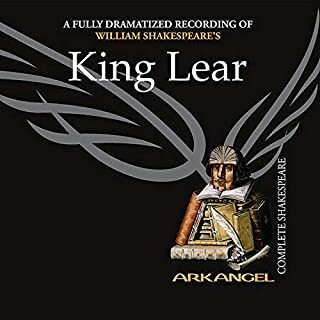 The ArkAngel productions are a wonderful supplemental component when teaching with Shakespeare. Having students listen while they follow along with the play, brings the words to life for them and allows them to see and hear the play, creating a more dynamic learning experience. I enjoyed the story, but was a little disappointed with the ending. I think I would like it better if I saw it.